Like any niche pursuit, sports journalism can be a strange beast: magazines like Sports Illustrated often spend enormous amounts of time on stories that few outside the bubble of the sports world have even heard of, let alone care about. But part of what makes the media different now is that any of those stories can burst through that bubble and reach a much larger audience — given the right combination of network effects — and that has changed (or should change) the way journalism works in some fairly fundamental ways. Grantland, the sports-journalism outlet that Bill Simmons created within ESPN, is at the epicenter of a firestorm created by exactly that phenomenon, after one of its writers published a piece about a mysterious inventor named Dr. Essay Vanderbilt, a tall and vivacious woman who had designed a revolutionary putter. At some point during the writing, however, Caleb Hannan’s piece stopped being about golf equipment and started being an investigative piece about Dr. Vanderbilt, who appeared to have invented some aspects of her past. Then came the terrible conclusion: Vanderbilt, who had been born a man and had manufactured most of her history as an inventor and as a businessperson, committed suicide just before the Grantland piece was published. Within a matter of hours after it was published and tweeted by its author, the Vanderbilt story was being posted and criticized by hundreds, if not thousands, of outraged readers — including many from the transgendered community — who found Hannan’s treatment of Vanderbilt’s sexuality callous and offensive, and blamed him for what they saw as his role in her death. As with many others who were critical of the story, I found it extremely disturbing, especially the cold and unfeeling way in which Hannan treated his discovery of Vanderbilt’s “true” gender — including the fact that he revealed this information to some of her former colleagues — and the way he treated her transgendered nature as something unsavory and even shameful. 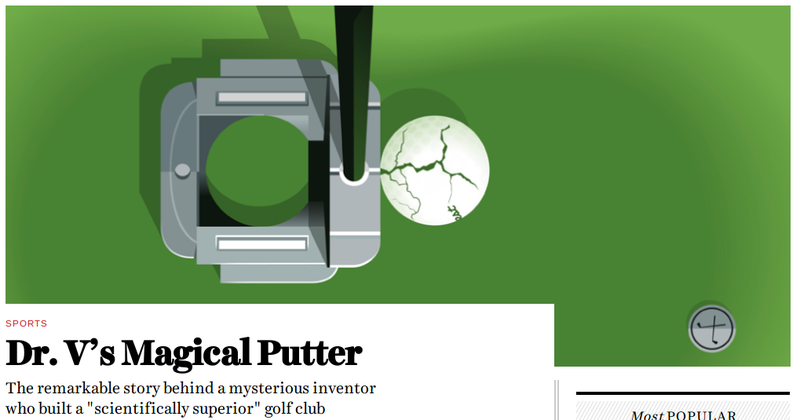 I agree with many of those who say Grantland erred by pushing the story ahead despite the obvious emotional instability of their subject (who had attempted suicide before), and by making Vanderbilt’s gender and sexuality a central topic of the piece, when it arguably had little or nothing to do with the putter technology they were writing about. They may not have caused her suicide, but their actions couldn’t be seen as anything other than hostile. Apart from the Vanderbilt story’s tragic outcome, however, what I find fascinating about the piece and its aftermath is something that also struck me about the recent controversy over New York Times writer Bill Keller and his wife Emma Keller’s tag-team columns on Lisa Adams and her cancer struggle: namely, how something that would have gone almost unnoticed by a wider audience before the social web exploded almost overnight and became a massive social phenomenon. If you think about what might have happened to the Keller pieces or the Grantland story in the days when traditional print publishing was the dominant force in media, both incidents would likely have remained within a certain circle of readers — New York Times and Guardian readers in the case of the Kellers, and Grantland’s sports audience in the case of the Vanderbilt piece (if you assume that kind of story would have been published in a sports magazine of some kind before the web). The Kellers’ columns might have triggered a few letters to the editor, or possibly a follow-up interview with Adams, but those would have come weeks or even months later. Similarly, the Vanderbilt story would likely have taken a relatively long time to reach outside the sports audience and find critics among the transgendered or any other community — if in fact it ever managed to do so. Many members of the story’s intended audience would no doubt have read it and thought little or nothing of it. Paradoxically, the web — and in particular the social web — helps to create and cater to niche interests, but at the same time also makes it easier than ever for topics or stories to “jump the tracks” and smash headlong into other niches that cater to completely different interest groups.Ultimately, I think that’s probably a good thing, not just for those who have varied interests, but for journalists as well. As painful as the process might be, it forces (or at least should force) writers like Hannan and the Kellers — and outlets like the New York Times and Grantland — to confront their preconceptions and misconceptions publicly, and to defend or even change them. For every Twitter-storm that becomes a mob, there’s another that has something to teach us about ourselves.